This image combines photographs taken by the Mars Hand Lens Imager (MAHLI) at three different distances from the first Martian rock that NASA's Curiosity rover touched with its arm. PASADENA, Calif. -- NASA's rover Curiosity touched a Martian rock with its robotic arm for the first time on Sept. 22, assessing what chemical elements are in the rock called "Jake Matijevic." After a short drive the preceding day to get within arm's reach of the football-size rock, Curiosity put its Alpha Particle X-Ray Spectrometer (APXS) instrument in contact with the rock during the rover's 46th Martian day, or sol. The APXS is on a turret at the end of the rover's 7-foot (2.1-meter) arm. The Mars Hand Lens Imager (MAHLI), on the same turret, was used for close-up inspection of the rock. Both instruments were also used on Jake Matijevic on Sol 47 (Sept. 23). 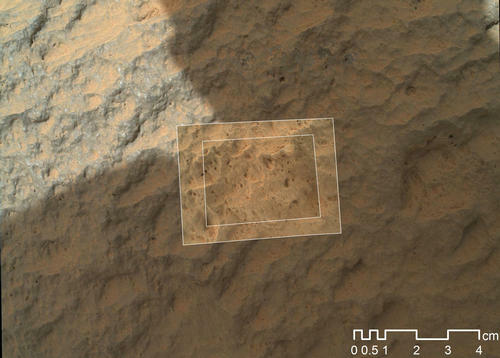 The Chemistry and Camera (ChemCam) instrument, which shoots laser pulses at a target from the top of Curiosity's mast, also assessed what chemical elements are in the rock Jake Matijevic. Using both APXS and ChemCam on this rock provides a cross calibration of the two instruments. 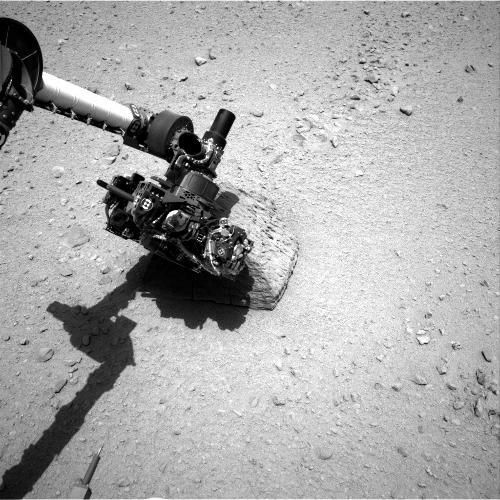 With a final ChemCam laser testing of the rock on Sol 48 (Sept. 24), Curiosity finished its work on Jake Matijevic. The rover departed the same sol, with a drive of about 138 feet (42 meters), its longest yet. Sol 48, in Mars local mean solar time at Gale Crater, ended at 3:09 p.m. Sept. 24, PDT. Curiosity landed on Mars seven weeks ago to begin a two-year mission using 10 instruments to assess whether a carefully chosen study area inside Gale Crater has ever offered environmental conditions favorable for microbial life.